Research paper for John Gerrard during the development of Pulp Press (Kistefos) 2013. The forester who, in the wood, measures the felled timber and to all appearances walks the same forest path in the same way as did his grandfather is today commanded by profit-making in the lumber industry, whether he knows it or not. He is made subordinate to the orderability of cellulose, which for its part is challenged forth by the need for paper, which is then delivered to newspapers and illustrated magazines. The latter, in their turn, set public opinion to swallowing what is printed, so that a set configuration of opinion becomes available on demand. Yet precisely because man is challenged more originally than are the energies of nature, i.e., into the process of ordering, he never is transformed into mere standing-reserve. Since man drives technology forward, he takes part in ordering as a way of revealing. 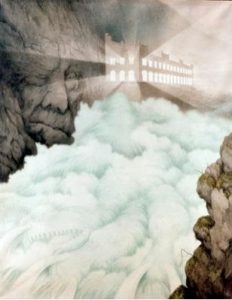 The perennial nature of this suspicion – right up to contemporary guilt and anxiety over the explosive growth in human activity made possible by the exploitation of mineral resources – makes it all the more peculiar that the central figure of Heidegger’s text is not a coalmine but a hydroelectric dam. But this is not central to Heidegger’s account. For him, it is the ‘challenging-forth’ of energy, its ‘unlocking’ and ‘storing’ and ‘transmission’, that constitutes the decisive step toward a new economy. And this shift we find at work in the modern history of waterpower as much as in the mineral-fuelled machine economy. The symbol of the hydroelectric dam, for Heidegger, signifies that even those features of the world with which we originally dwell in a state of mutual belonging are turned, on the model of mining, into mere physical resources. With the hydroelectric dam, the river is alienated from that constellation of man and his work in which man might properly dwell with technology in its ‘poetical’ essence (notably treated in Knut Hamsun’s  Markens Grøde [Growth of the Soil]). The river ceases to poetically ‘reveal’ the world with man; instead, both become slaves to its ‘standing-reserve’. This determination of human geography by physical geography held from mediaeval times, when small groups of Norwegian farmers would group together to ensure a local energy source for grinding flour, in the shape of a water wheel.8 The relatively few locations where the flow of water between mountainous peaks could be extracted became centres of population. The waterways not only provided power, but served as a means of transport, providing a ready-made distribution network, with logs floated down the waterways, stored in lakes, to be delivered to the mills, processed and shipped abroad. During the long unbroken tradition of using waterpower the use of water as power-source has invariably fixed man to the sites where ‘nature’ makes this power available. The use of waterpower limits location, and the energy produced must be consumed on the spot. 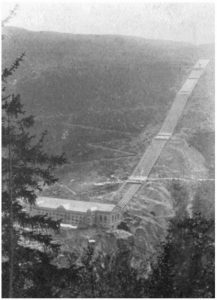 But the very immovability of hydroelectric energy called for innovative thinking, and prompted some important early industrial developments in Norway. Sam Eyde, founder of Norsk Hydro, would commercialize Birkeland’s discovery of the electric arc method of nitrogen-fixing, as a way to employ in situ the excess energy harnessed by the hydroelectric power station at Rjukan to produce artificial fertilizer. (The later successor to this mechanism, the Haber-Bosch process, would open up a far more intensive route for artificial fertilization, this time with the use of petrochemicals as a power source. Intriguingly, Haber-Bosch was a side-result of the military development of explosives, much as Birkeland’s discovery of the electric arc nitrogen-fixing mechanism had been an accident while engineering an electrical cannon. As a by-product of the Birkeland-Eyde process, the plant produced Deuterium – a Hydrogen isotope later used by the Germans in their nuclear programme, leading to the allies’ famous 1944 sabotage of Vermok). The greater number of the most important waterfalls in Norway are situated either far inland or on the south-west and west coast fjords, or in the north, in thinly populated neighbourhoods. There was no appearance of being able to find any rational use for these waterfalls. Now, however, the difficulties may be said to have been practically overcome, as the electric energy can be transmitted to very great distances. Norway was long a poor country, whose most important articles of export were timber and fish. The rivers were therefore, up to the latter half of last century, only utilised for floating down timber, with here and there sawmills or other small mills driven by primitive water-wheels. Those were the days in which the Norwegian valleys lay in all their pristine purity, when the rivers teemed with salmon and trout, and the forests and moors with game, and the only foreigners who visited them were almost exclusively sons of Albion in search of sport and recreation. 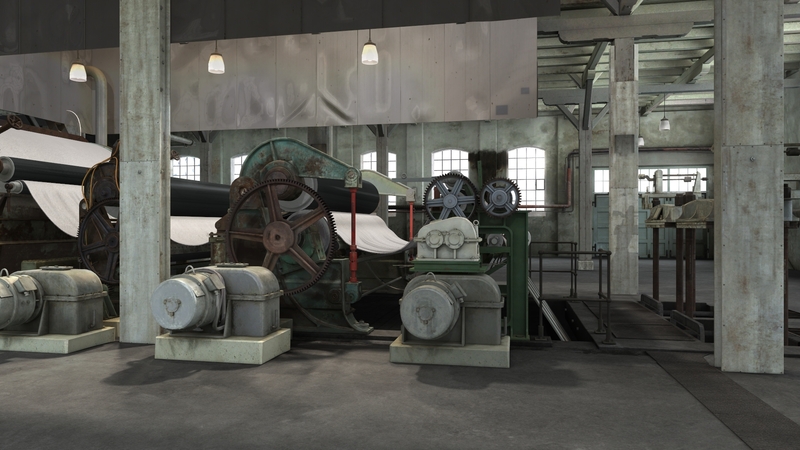 But soon the water-power began to be more and more made use of for the Wood-Pulp Industry, which, in the course of a comparatively short time, grew to be of such importance that now, in conjunction with cellulose and paper, exports represent the annual value of 56 million kroner. From October to April or May the rainfall in the higher parts of the country takes the form of snow, and during the winter months it only rains along a strip of the coast and up the fjords. The rainfall cannot, therefore, be at once utilised, and from December to April or May the rivers bring down least water. In May a flood occurs, on the melting of the lower snows-the “home flood,” as it is called-while the biggest flood comes in June or July from the melting of the great masses of snows on the highest mountains. 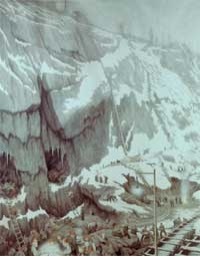 In Norway, as elsewhere in Europe, the nineteenth century saw a new compact between the artistic and the industrial. 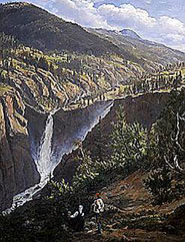 Industrial exploitation of the powers of nature was echoed by artists’ romantic fascination with them. In the ‘Nordic sublime’ (Norwegians Peder Balke, J.C. Dahl, the Danish painter of Norway Erik Pauelssen), and the related growth of tourism, in which the ‘wildness’ of nature was staged and presented, a new aesthetic appreciation that emerges in parallel with industrial expansion. The waterfall is now conceived on a terrestrial-geological scale – it is exhibited by the sublime painters alongside the classic symbols of ocean and volcano, reflected upon in light of the deep geological time that threatens to usurp the biblical chronicle of the earth. This is no longer the poeisis of the waterwheel that gently taps into energy on a human scale, and thus can be opposed to the transgressive extraction of petroleum. 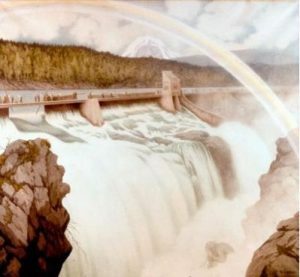 In line with the increasingly massive-scale exploitation of the power of water, this art now expresses a fascination with nature no longer as beautiful but as forbidding and overwhelming; a pure power to be marveled at, but also to be mastered. In the crucial early decades of the twentieth century, in parallel with such ambitious projects, water had become very self-consciously a symbol of national identity for Norway, and for its increasing anticipation of full modernization, concurrent with the independent ‘rebirth’ of the nation in 1905. 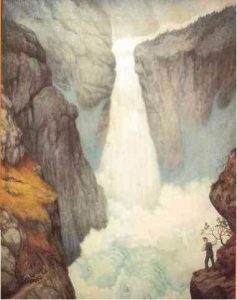 In 1906, a law was passed imposing a ban on foreign purchase of waterfalls, bringing them under public control, ensuring through a concession arrangement that these ‘assets’ would eventually revert to the state, and through other measures that the related industries would provide work for Norwegian workers. […] in the same way as the charms of wild natural scenery appeal to the overwrought, busy people of to-day, there are also those who feel a call to utilise those great natural resources in order to improve the material prosperity of the country and the condition of the people. Contemporary developments suggest that on a rapidly-transforming planet, the age-old path of waterpower, and the highway of modernity – the human project of endless growth and energy consumption – are converging once again. In China, where the Three Gorges Dam has already been completed after vast expenditure and the displacement of millions of people, controversy now rages over the plans to build a 21.3GW dam in the Nu river, with conservation groups fighting to save the world heritage site’s biodiversity and endangered species. The ambitious Chinese hydroelectric programme addresses not just the growing demands of the new Chinese economy and the potential for cross-border energy sales, but international pressure for reduced fossil fuel emissions. Meanwhile, ongoing climate change finds energy companies prospecting at the melting ice caps, hoping to find minerals exposed by the retreating ice, and utilize hydroelectric power to process them – a ‘white gold rush’ for new sources to power the global information economy. –– H. Dorffman, Labor Relations in Norway (Oslo: Norwegian Joint Committee on International Social Policy, 1966). –– E. Lo Cascio and P. Malanima, ‘Mechanical Energy and Water Power in Europe: A Long Stability?’ In E. Hermon (ed. ), Vers une gestion intégrée de l’eau dans l’Empire Romain (Rome: L’Erma di Bretschneider, 2008). 201-8. –– Howe, J. L. ‘Notes on Norwegian Industry’, The Popular Science Monthly, Jan. 1912, 36-50. –– Moses, Jonathon W., Norwegian Catch-Up: Development and Globalization before World War II ( Aldershot: Ashgate, 2005). –– Nynäs, H., ‘Water as a symbol of national identity in Norway’, in The Basis of Civilization – Water Science? (Proceedings of UNHSCO/IAI IS/IW1IA symposium held in Rome. December 2003). IAHS Publ. 286. 2004. –– Scott-Hansen A, and Swinburne, J., ‘Hydro-electric plants in Norway and their application to electrochemical industries’, Trans. Faraday Soc., 1911, 7, 78-91. In reading Agricola’s counterarguments one can surmise that ultimately this dispute around the nature and distributive mechanism of divine providence in fact already brings into play the modern anthropological question of the proper nature of man, figured through a metaphor of visibility: does the true nature of man (and God’s role for him) consist in a piety and compliance to what is spontaneously given and visible, or in an enterprising extraction of even those plutonic resources that are hidden and which (according to pre-modern thought) ‘grow’ at a rate too slow for their yield to be replaced. In globalization, ‘international influences join with domestic institutions to produce hybrid mixtures … Each nation is a prism through which the global is refracted, at the same time that the global dilutes, homogenises, releases nations from their territorial limitations.’ – Moses 27,43. ‘The chief physical elements are the mountains and glaciers largely uninhabitable and untillable, covering more than half of Norway. As a matter of fact, more than 70 per cent of the nation’s area is waste land, as far as economic development is concerned’ – Dorfman 7. Heidegger, ‘The Question Concerning Technology’. Scott-Hanssen 91. It is unlikely that Heidegger would have been convinced by such a compromise, for he saw how the modern aesthetic of the ‘landscape’ was itself produced contemporaneously with its industrial exploitation: But, it will be replied, the Rhine is still a river in the landscape, is it not? Perhaps. But how? In no other way than as an object on call for inspection by a tour group ordered there by the vacation industry.